The idyllically set town of Baños has long been popular with Ecuadorians and foreigners alike. Baños means 'baths,' which is precisely what the town is famous for. Some of them are fed by thermal springs from the base of the active Volcan Tungurahua, which means 'little hell' in Quechua. Other baths have melt water running into them from Tungurahua's icy flanks. Locals swear that the baths are great for your health. 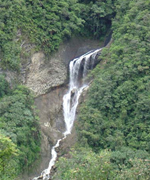 Baños' elevation gives it an agreeable climate, and the surroundings are green and attractive. During the week, Ba�os is a sanctuary of peace and quiet. The big events here are the occasional traditional Andes produce fair and the English-spoken film shown nightly in the movie theater or the town chapel; However, on weekends and feast days Ba�os becomes a "carnival town". The natural beauty that envelops Baños and its contrasts in climate make it the ideal spot for a fabulous holiday. The Basilica attracts many pilgrims. The paintings of miracles performed by Nuestra Señora de Agua Santa are worth seeing and there is a museum with stuffed birds and Nuestra Señora's clothing. Three sets of thermal baths are in the town. The water in the hot pools is changed three times a week, and the cold pool is chlorinated. The best time to visit is early in the morning. All the baths can be crowded at weekends, but the water is usually clean (its brown colour is the result of mineral content) and is almost always hot. There are also the Santa Clara baths, which are thermal, but only tepid. They are popular with children and have a gym and sauna. For the more adventurous, the road from Banos to Puyo provides a scenic approach to the Amazon basin. The area boasts more than 20 waterfalls, some hanging over the road, and others reached by short trails. The volcano Tungurahua is located in the south of Ecuador and ten kilometers from Baños, where it provides the city with their famous hot springs. Since the many eruptions beginning in late 1999, much of the snow has melted, and the cone and crater have changed in shape. Tungurahua's eruptions are called "stromboliano" eruptions. During this type of eruption, the volcano almost constantly emits gas and vapor. This steady release of energy avoids highly explosive buildups. The volcanoes Arenal, in Costa Rica, and Stromboli, in Italy, are of the same class as Tungurahua. The former has also become a major tourist attraction.